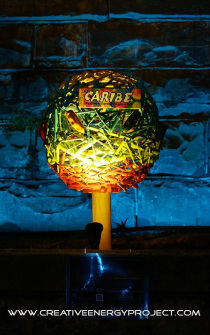 A community sculpture designed and built by Robert R. Norman in collaboration with The Creative Energy Project and the community and guests of Eureka Springs. The project was sponsored by the Eureka Springs Chamber of Commerce as well as other area businesses, with the finished work being installed in Basin Spring Park during May Festival of the Arts, 2013. 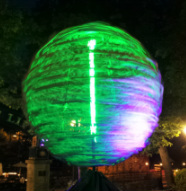 The public unveiling of Sphere was celebrated at Sphere Ultraviolet on May 11, a launch party organized by the Creative Energy Project with participation from the Eureka Springs Downtown Network and attended by over a thousand guests. The design itself reflects the luminescence and grand scale of sculptures displayed annually at the Burning Man festival in Nevada, in which Robert has participated as an artist, and the construction of the exterior from sustainably gathered materials is fundamental to his signature style. Built from refuse produced by maintaining trees in Eureka Springs' parks and the community as a whole, the sphere diverted materials from being burnt or entering the landfill. The sculpture is comprised of hundreds of pieces, each bearing vision statements from the participants, expressions of their hopes and dreams for the future. These statements form the interconnected web that unites the Sphere, representing each person's connection to the community and the planet. It rotates on a central axis that is illuminated with multi-colored LEDs, giving the work an internal radiance that continually transforms. Also lit from without by powerful ultraviolet lights, Sphere's color palate is as diverse as the individuals contributing to it. 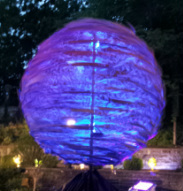 The unveiling of the fully completed Sphere occurred at the Creative Energy Project's grande finale to ArtRageous Parade, Sphere Ultraviolet, which was held in Basin Spring Park in the twilight of the evening. The spinning of the Sphere accentuated the fast-paced drumming and dancing going on around it. 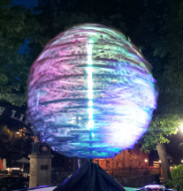 Bringing Sphere to the public was an experience initiated and shaped by the Creative Energy Project (CEP). The CEP is the vision of photographer Jeremy Mason McGraw, who works with artists to promote their work and create a public discussion about it. 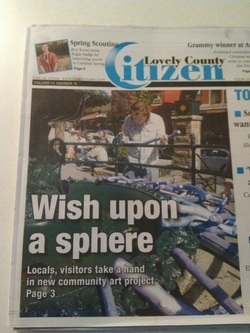 McGraw proposed Norman's idea of Sphere to the Eureka Springs Chamber of Commerce and the Parks and Recreation Commission, and they agreed to support the community-building project and install it in Basin Spring Park for the month-long May Festival of the Arts. From inception to completion, the project spanned three months and involved nearly 600 volunteers. Each phase was documented with creative and energetic videos that sparked community interest. Beginning in the materials collection phase of the work, volunteers were involved in Stick gatherings that were organized and promoted by the Creative Energy Project and the artist using social media and the press. The collected sticks were cut, sanded, and painted at The Studio of Robert R. Norman in preparation for Stick Painting parties, events that were open to the public and held at locations around Eureka Springs. Organized by the CEP, local business sponsors, and the Parks and Recreation Commission, the gatherings were opportunities for locals and guests to write vision statements on the sticks that would later be added to Sphere. The vision statements written were very diverse; each statement was transcribed and cataloged by Robert's partner, Suzanne Stillman. Read about the web of statements making up the Eureka Springs Chamber of Commerce Sphere in Suzanne's blog posts on the Creative Energy website.